I grew up on a farm and have been surrounded by animals my entire life. At a young age, I took on the role of caretaker to the farm animals and often times nurse to sick animals on the farm. Whether it was a sick chicken, calf, crippled duck or baby bird that fell out of the nest, I always tried to nurse them back to health. Sometimes it was successful and other times not, but it was not for lack of effort. My passion as a young girl was horses and I began showing at the age of eight and horses were a big part of my life into my early adulthood. A had a very special bond with my first horse, Penny. She was born on our farm when I was 5 years old and we were together until she passed at age 25. About 15 years ago, I discovered the wonderful world of dog sports and my life has not been the same since. Over the years, I have become a student of good nutrition and natural supportive healthcare for my entire family (human and canine). I believe that there are many ways that natural remedies in conjunction with traditional veterinary medicine can enhance the quality of life for our animal companions as well as enhance the body’s ability to heal. I have seen first hand the benefit of canine massage and natural therapies with my own dogs over the years and am excited to pass this benefit along to my clients. Faith, our sweet blind baby, was adopted from RAGOM in the fall of 2012. We decided to bring a younger dog into our family and I was thinking it was time to get another dog agility prospect, so we put in our adoption application to RAGOM. About a week after putting in the application and receiving our home visit, I was contacted by Faith’s foster mom Joyce. Joyce wrote me a letter from Faith. Faith told me all about herself (the good and the bad) and asked if maybe instead of getting another agility dog that maybe I would enjoy training a blind dog to do therapy work. I quickly read Faith’s bio on the RAGOM website and talked this over with my husband Dean. I spent an hour on the phone with Joyce and two days later we drove to St. Cloud to meet Faith and her foster family. Faith came into RAGOM when she and two of her littermates were just puppies. Her brother Russell was born deaf and is blind in one eye and her sister Tilly is near-sighted. Faith was now 9 months old and had grown into a beautiful, busy young lady. Joyce had not found the perfect home for Faith until now, and a few weeks later we brought our sweet girl home. It has been quite and adventure taking in a very busy, very active blind dog, but it is a decision that we do not regret for a second. Faith is truly the happiest and sweetest dog that I have ever met and the joy she exudes is infectious. She has taught us to live everyday with joy and to continue to live in the moment and I attribute her as the primary reason that I decided to leave the safety of the corporate world and pursue my passions. Sara is a 14 year old golden retriever who I rescued from RAGOM in 2001 at the age of around 3 months. RAGOM rescued 14 golden retrievers who were being kept in a stall in a barn. When Sara came home she was scared of everything, but her older sisters Abby and Ellie soon brought her out of her shell and she became a playful little girl. 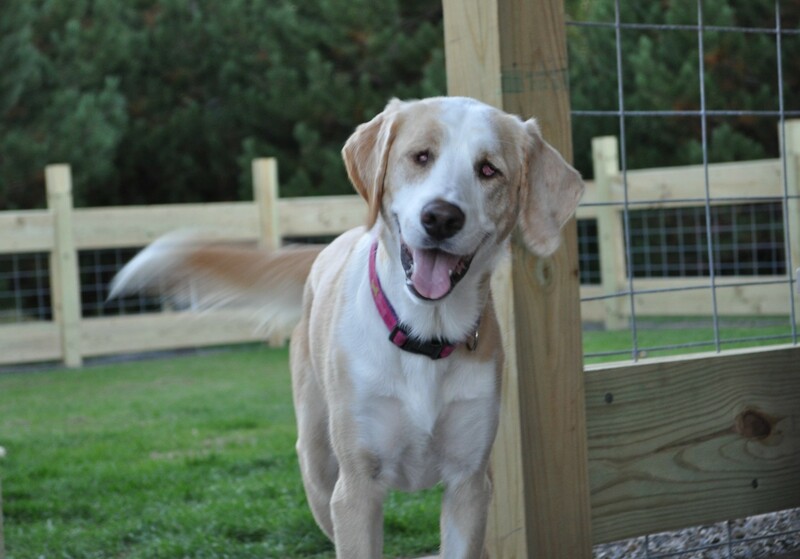 Sara competed in dog agility, obedience and rally. 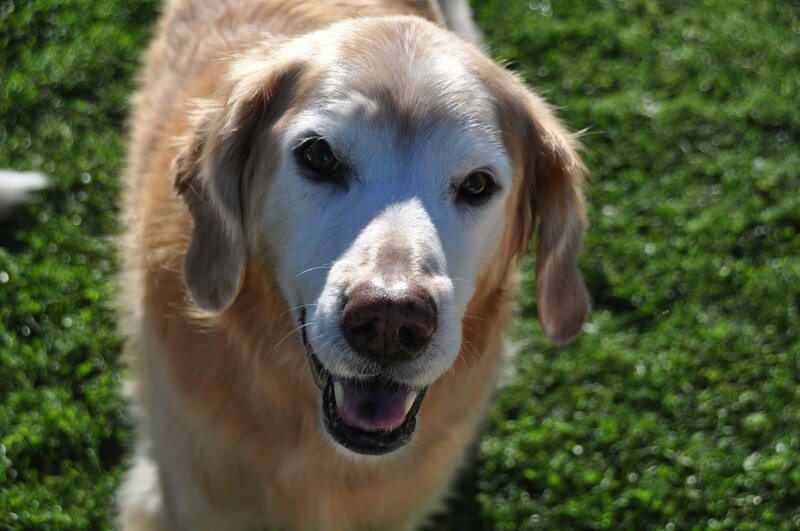 She is the true quintessential golden retriever who loves to love, has the “golden nudge” mastered and now enjoys being a couch potato while supervising the antics of her canine sisters. Angie was adopted from Friends of Animals in 2012 and we don’t know how old she is but are guessing she is around 11 or 12. Her name at the shelter was Angel, but thinking that no dog would be able to live up to that name, we changed her name to Angie. She has more than proven that she truly is an angel put here for a special purpose. 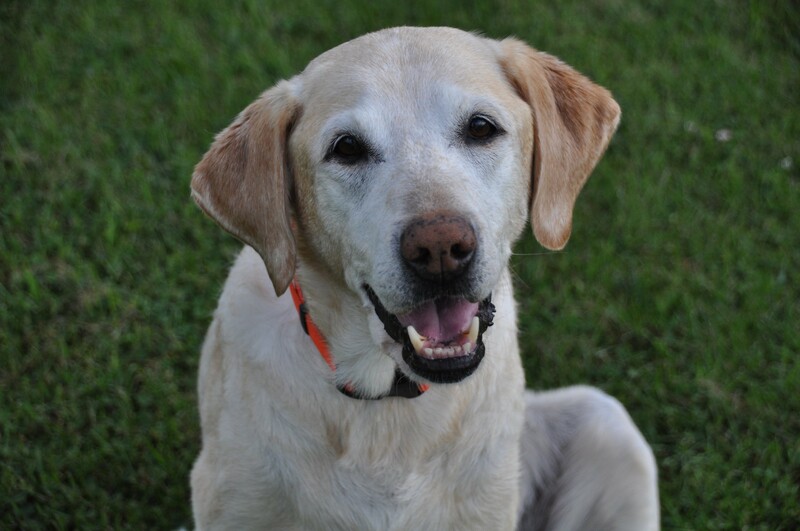 A month after Angie was adopted, my first agility dog and my heart dog Ellie passed away suddenly from hemangiosarcoma. I was devastated and Angie took her role as angel quite seriously as she licked away my tears and helped heal a broken heart. Five months later we adopted our little blind girl, Faith, and Angie had to take on a new special role and caretaker to a busy blind dog and she did so with such grace. 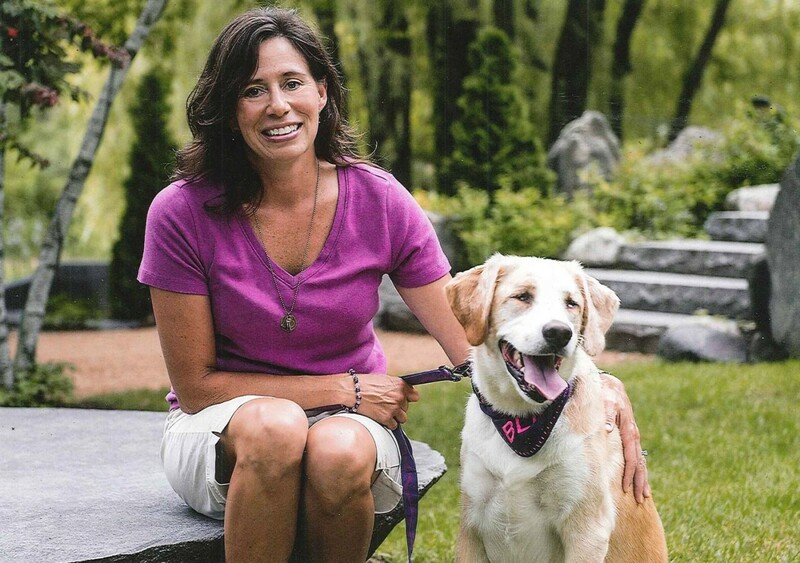 Angie was diagnosed with mammary carcinoma earlier this year, but we are happy to report that with good healthcare, a special cancer diet and lots of love, she is now cancer free and recently was the honorary cancer survivor at Bark for Life in Superior, WI. Lucy was adopted from Friends of Animals the day after Christmas in 2014. 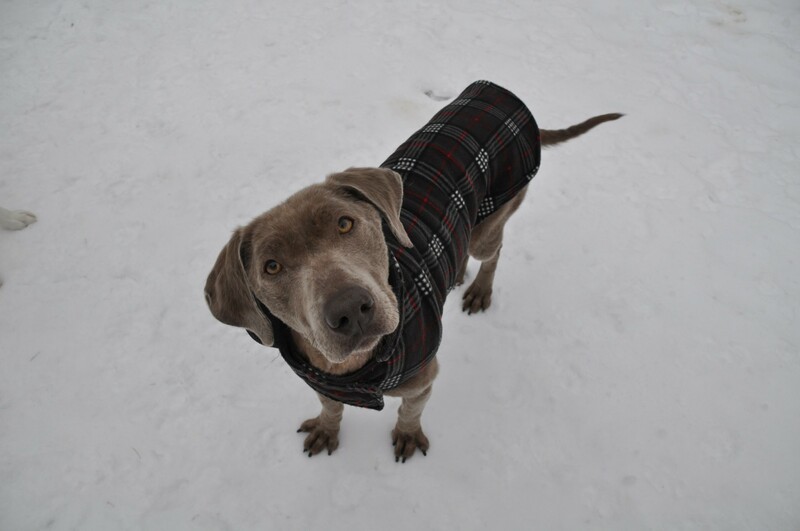 On Christmas eve, I was sitting on the couch scrolling through Facebook and came across this posting of a scared, very skinny, nearly bald (from poor nutrition and recently having a litter of pups), silver lab at the shelter. Her story broke my heart as she was used as a breeder dog and turned into the shelter in early December. Within hours we stopped to visit her on our way out of town to visit family. The sight of her just broke my heart and she just cowered when we reached out to pet her. As soon as the shelter opened the day after Christmas, we brought the other dogs to the shelter to meet her and an hour later she was on her way home with us. It has been a long road to bring this girl back to health and to build her confidence, but she has come such a LONG way. Lucy is now the “class clown” of our house and has become Faith’s tug partner and wrestling partner. Lucy has done a great job taking over Angie’s role and blind dog caretaker. Angie still “fills in” once in a while, but is content to sit back and watch the young dogs go at it!